Until they're all home//New merch and a giveaway!! The truth remains that bringing Abby home is a huge milestone. It is the closing of one chapter for our family: the chapter of waiting, of fundraising, of trusting, of waiting some more...this part is over for us. But not for our friends. We have three dear friends still in that phase, still waiting, still fundraising, still trusting in the Lord to provide the means to bring their babies home. If you've been around this blog for a while, then you've met my friends. We all worship together each Sunday, we share the same heart for orphans and adoption, and we've become family. They have been with us through each step of bringing Abby home, and we have been along for each part of their process as well. We are in this together. And so then, for us--it's not over. It's not over until they're all home. Needless to say, we are all anxious to have Zahra home! The Masers are on the waiting list for a baby boy, and we are all hoping that the call will come soon...we can't wait to see his little face! Once that call comes in, they will need $8000 for their referral fee, and they will still have two trips to fundraise for. It seems insurmountable, but God has provided thus far for their adoption and I know He will continue to do so. The Waulks are adopting domestically, and their birth mom is due in March. We are so excited, because they just announced this weekend that "IT'S A GIRL!!" We are overjoyed for them. They still have over $10,000 in fees, and are trusting the Lord to provide. The New Merch and a Giveaway!! So, I will give a peek into the merchandise we have added to our site to help these families bring their babies home. For a full listing, click on my "Merch" page at the top of my blog. We first made these Africa banners for our raffle fundraiser back in March as decoration. They ended up hanging in our church for months, because everyone loved them! They are made on burlap, and come in either black or tan. They are $20 total shipped with no dowels (hanging cord included), or $30 for the banner with the dowels included (the increased price covers the increased shipping costs). Details, size, etc are on the merch page. So that's it! A fun variety! And we still have a few shirts left, still listed under the Merch page as well, and any profits from those sales will be lumped in as well. I am giving away one of the nickel crosses! Help spread the word by posting about this giveaway and linking back to this post. Be sure and leave me a comment to let me know how you've entered! I will draw a winner on Wed, Feb 2nd! and walk together as sisters and brothers." Today, as we remember Martin Luther King, Jr., I am reminded of how far we have come, and yet aware of how far we still need to go. Our adoption has brought these things into the forefront of our own family's awareness in the last year and a half. There is beauty in our experience, but great pain as well. But our hope rests firmly in this: that racial inequality and injustice face their demise at the foot of the cross, where, once and for all, Jesus conquered our stereotypes, demonstrated true love, and died for our sins of pride and hate. This repost from August of 2009 is in honor of that truth. My family knows that I hate to go to Blockbuster. Too many choices, and I am picky when it comes to movies. If I don’t see something I like right away, I go home empty handed. So we usually send Joe. He’s more willing to take a chance and try something new. But when he walked in last night with the movie, The Express, with a credit on the back saying it won the “Truly Moving Picture Award”, I have to admit, I gave him a hard time. I shot him a pained expression and said, what is this, a Hallmark movie?? But two hours later, I was no longer complaining. It was a good movie, and touched on a subject currently close to home. The movie tells the true story of Ernie Davis, the first African-American to win the Heisman trophy. The setting is the late 50’s, early 60’s. Ernie gets recruited to play football for Syracuse University in NY, where he is one of only a few African American players on the team. And not just on the team, but in the school, and not just in that school, but in college in general. He deals with rude looks and sideways glances, not to mention some snide remarks. But it isn’t until the team has to travel south that you really see the odds he had to face during this pivitol time in America’s history. I love Texas. I love being from Texas. We have the coolest history (six flags and all), and I have always been proud, wherever I’ve lived, to say I am from Texas. But last night, I was not proud. Texas and its residents were a caricature of prejudice. First, Davis and the other African American players are not allowed into the main hotel and so must sleep in workers quarters. During the game, Texas fans sneer and yell and throw glass bottles and food as the team come onto the field. At one point, the coach tells the players not to take their helmets off, even if they are on the sidelines, to protect them from the flying debris. The Texas players were unnecessarily brutal towards Davis, and the refs obviously biased. The coach even repeatedly pulled Davis out, right before scoring, so a black man wouldn't score the touchdowns against Texas! He knew it could mean dangerous backlash for both Davis and his team. I understand this is a drama, but I also know it probably was not too far off the truth. It made me literally sick to my stomach. How could we, as a state, as a nation, as human beings, be so shallow and arrogant and flat out evil? Why did we hate someone so much, just because they were a different color? It would have been at least somewhat comforting if I could have told myself—but yeah, that was 50 years ago!! We’ve come a long way since then. But I couldn’t. Because just this week I had a relative tell me that if I adopt a black child, it will not really be my child, nor a part of my family. I don’t think I’m naïve. I realize that interracial adoption has its dissenters. I just didn’t expect such hostility. From someone I love. Was I hurt? More than I thought I could be. Does it change anything? No, not in the slightest. If anything, it strengthens my resolve because apparently there are still people who think race and color should designate separation, be it at water fountains or in families. That two that are different might be able to coexist, but cannot and should not mix. And if the gospel is true, then that is ridiculous. Everyone…, if in Christ, has been transracially adopted. [Those opposed to transracial adoption] are blissfully unaware, it seems, that what’s resting on them is the spirit of the antichrist. They seem not to comprehend that their own devotion to the flesh would disqualify non-Semitic folks like them from the promises of God. If Jesus agreed with them on adoption and race, they’d be in hell. Does that sound harsh to you? To me it sounds true. As much as I love my relative, this part of their heart is ugly to me. And if I’m honest, it reminds me that my heart is dark as well, ugly with sin, undesirable to a holy God, and in need of redemption. Praise God, that in spite of my sinful state, He adopted me as one of His own. So if Ernie Davis can have the courage to face all he faced (and I don’t even know if he knew the Lord), then certainly I---who "has not been given a spirit of fear, but of power, love, and sound mind"--- can endure. And if you are reading this, and you struggle with my family’s decision, and also say you know Christ, then I challenge you to search His Word for any indication that your hang-ups have validity. Because we're all mutts. And, like it or not, sisters and brothers. Family. While January 7th is most well known for being my birthday ; ), it also happens to be Ethiopian Christmas! So “Melkam Genna!”, Merry Christmas from Ethiopia! We are all set to leave tonight and head for home. We are anxious to see our other kids and begin to really show Abby what it means to be a part of the Walser family. While Abby and our adoption process has been the focus of this trip, we have also had some wonderful time with friends here. We enjoyed dinner and fellowship with Peter and his wife Elizabeth. We met with Bisrat to give him some books and encourage him in his desire to partner in planting churches in Ethiopia. And we have thoroughly enjoyed the Triers and their Ethiopian family here where we are staying. What a blessing, to have a place to stay for free and get such wonderful fellowship at the same time. This evening, before we leave, we will enjoy a traditional Ethiopian Christmas dinner together. We are so honored. Obviously we have occasional internet, but not for long and we usually have focused our attention and efforts on connecting with our kids. So I haven’t been able to read all your comments or facebook posts, and certainly have not been able to respond--but know we feel the love and support of each of you. We are so thankful for your prayers. We look forward to seeing many of you tomorrow!!!! JOY! Until then, hugs and love from Ethiopia! As we prepare to bring Abby home, we felt it necessary to write a letter to our family and friends, letting them know what to expect in the days ahead. I am posting it here for you as well. After a year and a half of waiting, praying, longing, hoping--- little Abby is almost home! We are overjoyed at God's grace, but we also realize this will be a season of adjustment for our family. We know that each of you receiving this letter has-- in some way-- supported, loved and prayed for us. Because we know your care for Abby and our family, we want to share with you some information that we hope will best equip everyone around her to assist us in laying the strongest and healthiest foundation – emotionally, physically and spiritually. In many ways, Abby will be like the children who entered our family through birth; we will seek to bring all of them up in the instruction and discipline of the Lord. But there will be a few, initial differences in the way we have parented in the past. We are confident of this: God’s design is PERFECT! His plan for parents and children is a beautiful and meaningful picture of His love for us. Attachment between a parent and child occurs over time when a baby has a physical or emotional need and communicates that need. The primary caretaker (usually mommy) meets the need and soothes the child. This repeats between a parent and child over and over to create trust within the child for that parent; the baby is hungry, cries in distress, mom nurses & calms the baby – which teaches her that this person is safe and can be trusted. By God’s very design, an emotional foundation is laid in the tiniest of babies, which will affect their learning, conscience, growth and future relationships. The security provided by parents will, ultimately, give children a trust for and empathy towards others. Children who come home through adoption have experienced interruptions in this typical attachment process. The loss of a biological mother and father at an early age can be a major trauma on their little hearts. Abby will soon experience the loss of familiar and comforting caretakers as well as the sights, smells, and language of her birth country. When Abby comes home, she will be overwhelmed. Everything around her will be new and she will need to learn not just about her new environment, but also about love and family. She has not experienced God’s design for a family in an orphanage setting. Her world will turn upside down. She will struggle with feeling safe and secure and she may lack the ability to trust that we will meet her needs. The good news is that we can now, as Abby's parents and forever family, rebuild attachment and help her heal from these emotional wounds. The best way for us to form a parent/child bond is to be the ones to hold, snuggle, instruct, soothe and feed her. As this repeats between us, she will be able to learn that parents are safe to trust and to love deeply. We are, essentially, recreating the newborn/parent connection. Once Abby starts to establish this important bond, she will then be able to branch out to other, healthy relationships. Abby will have, what may seem like, a lot of structure, boundaries and close proximity to us. Although it may appear that we are spoiling her at times, we have been advised that it is best that we meet every need quickly and consistently. She may show her grief and confusion in many ways, and we are prepared to help her through it and prove that we are a forever family. You may also notice us tighten our circle a bit, stay close to home, and we may seem a little less available socially, at least Rachel and Abby, for a while. Please know that these decisions are prayerfully and thoughtfully made choices based on our personal research and instruction from trusted adoption mentors. We will be doing what we believe is best to help her heal from those interruptions in attachment as effectively as possible. The first is to set physical boundaries. It will help us immensely if adults limit what is typically considered normal, physical contact with Abby. This will (for a while) include things like holding, excessive hugging and kissing. Children from orphanage settings are prone to attach too easily to anyone and everyone – which hinders the important, primary relationship with parents. Waving, blowing kisses or high fives are perfectly appropriate and welcomed! Abby should know that the people with whom she interacts are our trusted friends. Another area is redirecting Abby's desire to have her physical and emotional needs met by anyone (including strangers) to having us meet them. Orphans often have so many caretakers that they, as a survival mechanism, become overly charming toward all adults. A child struggling to learn to attach may exhibit indiscriminate affection with people outside of their family unit. It may appear harmless and as if they are “very friendly” but this is actually quite dangerous for the child. To share this is difficult for us because you have openly loved on our other children and we have loved on yours as well, and treasure that connection. Please understand that we want nothing more than to have Abby hugged, cuddled and cherished by ALL of you. But until she has a firm understanding of family and primary attachments, we would be so grateful if you direct her to us if you see that she is seeking out food, affection or comfort. Also, please feel free to ask us any questions at any time. We are learning, too, and are grateful that you are seeking with us to help Abby feel loved, safe, and secure. We are incredibly blessed to have so many loved ones around us. We couldn’t ask for a better extended family & circle of friends for our precious Abby. Thank you so much for your love and support over the past year. *I read other adoptive families' letters, and appreciate the wisdom and verbage I was able to pull from them for our letter, primarily the one from Babe of my Heart. This morning is the beginning of day four in Ethiopia. We have had two full days with Abby. There is so much to share, it is hard to do in a single post. But we have loved every minute of our time with her. Our communication is decent enough to understand basic needs, but there is still a pretty big gap there. At times Abby is outgoing and precocious; at others, she is quiet and cuddly. I can only imagine the range of emotions she is experiencing. Even the city of Addis Ababa is full of new sights for her, as she is from a rural area. Each experience I have seen with new eyes: riding in a car, drinking a pepsi, taking a bath, eating peanut butter....many things are unfamiliar to her. Some things we continue to see unfold about her personality: she is all girl! Loves picking out clothes, having her hair done, painting her nails. She tends to take the lead when she is feeling secure—she likes to be in charge, especially when other kids are involved. And she is full of sweet love and a need for affection. We are so blessed. Today is our embassy appointment; it was bumped up a day because of Ethiopian Christmas. Our plan is still to leave on Friday evening to head for home. We still have a few friends to see and a few more fun things to do. Joe and I are having a blast experiencing everything together. Much love to all of you! We can’t wait to see you in a few days! P.S. We have spent much time with the Shubin’s precious Zahra. She is absolutely adorable, and she and Abby are already good friends. If you desire to do anything in honor of our bringing Abby home forever this week, please do this: go buy a shirt on Erica’s website, and help bring Zahra home. She is longing to be with her forever family, and you can be a part of that wonderful experience. Thanks. 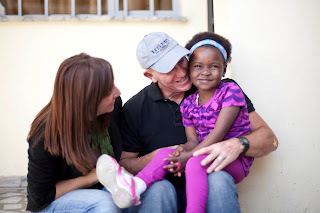 As you are reading this, we are in Ethiopia loving on our little Abby but also having the chance to meet our dear friends' daughter, Zahra. The Shubins are like family to us, and therefore Zahra is too! She will be Abby's playmate, and we just know they will be good friends! The Shubins are preparing to travel for their court date, hopefully in March. They still have some funds to raise for their travel. Go stop by their blog--Erica is selling the CUTEST t-shirts (seriously, we have like 10 of them between all of us in our house!!). They are wearing some of them in the picture above. If she sells 100, she'll have her first trip funded!! BUY ONE, and help bring Zahra home! !